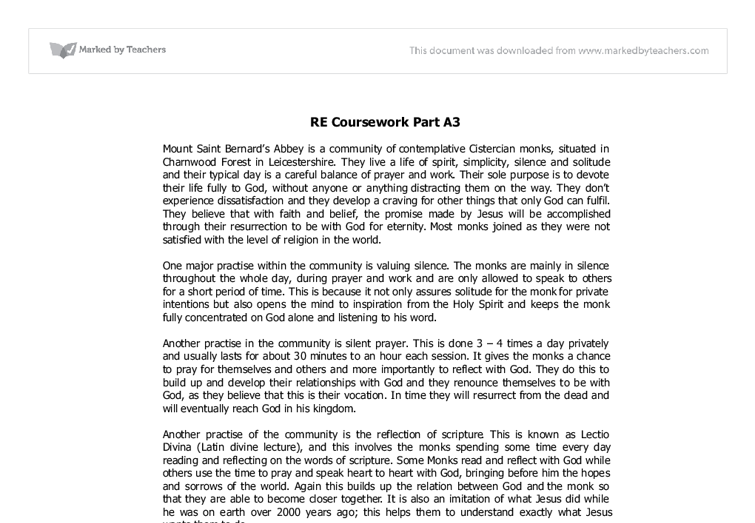 RE Coursework Part A3 Mount Saint Bernard's Abbey is a community of contemplative Cistercian monks, situated in Charnwood Forest in Leicestershire. They live a life of spirit, simplicity, silence and solitude and their typical day is a careful balance of prayer and work. Their sole purpose is to devote their life fully to God, without anyone or anything distracting them on the way. They don't experience dissatisfaction and they develop a craving for other things that only God can fulfil. They believe that with faith and belief, the promise made by Jesus will be accomplished through their resurrection to be with God for eternity. ...read more. Another practise in the community is silent prayer. This is done 3 - 4 times a day privately and usually lasts for about 30 minutes to an hour each session. It gives the monks a chance to pray for themselves and others and more importantly to reflect with God. They do this to build up and develop their relationships with God and they renounce themselves to be with God, as they believe that this is their vocation. In time they will resurrect from the dead and will eventually reach God in his kingdom. Another practise of the community is the reflection of scripture. ...read more. Another practise within the Community is the liturgical prayer. The monks lay aside their various day to day tasks in order to come together and give their undivided attention to God to praise and give him thanks. The prayer usually consists of psalms, hymns, readings and prayers. They do this as they believe that together with the Eucharist (the source of Christian life), and the whole Church, these times of prayer have a philosophical effect on the monk's union with God. Through liturgical prayer they sincerely seek God and gradually find and become closer to him. They eventually become part of the whole church and are able to aid others through their prayers. ?? ?? ?? ?? - 3 - ...read more. After this Jesus concludes by saying whatever is hidden away will be brought out into the open. The hidden meaning here is that we shouldn't cover up the Kingdom of God and also we shouldn't ignore the word of God but to allow it to be with you even in dark times. When Jesus was not far from the house the centurion sent some friends to Jesus to say that Jesus did not have to come into the centurion's house. This again showed that the centurion respected the Jews as it would have made Jesus religiously unclean to enter a Gentile's house. The seeds that fell in the good soil stand for those who hear the message and retain it in a good and obedient heart, and they persist until they bear fruit. 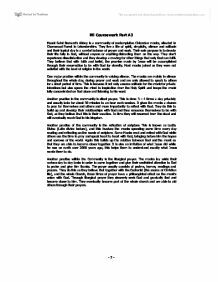 B) Discuss the meaning and relevance of parables to the belief of Christians today The parables are still seen as relevant today by Christians. Jesus explains the parable of the Good Samaritan and that the Samaritan that helped the Jew was his true neighbour. Jesus told the lawyer to go out and do the same. An everyday example of this is organ donor. They give up an organ to save others, despite the consequences they might face later on in life. Analyse and explain the work of ONE religious agency working for world development. Christian Aid works to help and improve the life of the poor people in LDC's. It started in194416 to help the insecure and unprotected just after the Second World War. The Opus Dei is one way they pray, however they sing it (they sing the praise of God). They sing this in the Abbey church; The Opus Dei is the singing of the psalms in the Old Testament, which they also focus on the actions done by God that are within our lives. the image of Christ's death is too intense whereas others claim that including Jesus' body is idolatry. Some Catholics and Protestestants believe, however, that a crucifix bears more meaning than just a plain cross, because of the fact that crucifixion was a main torture in the past.